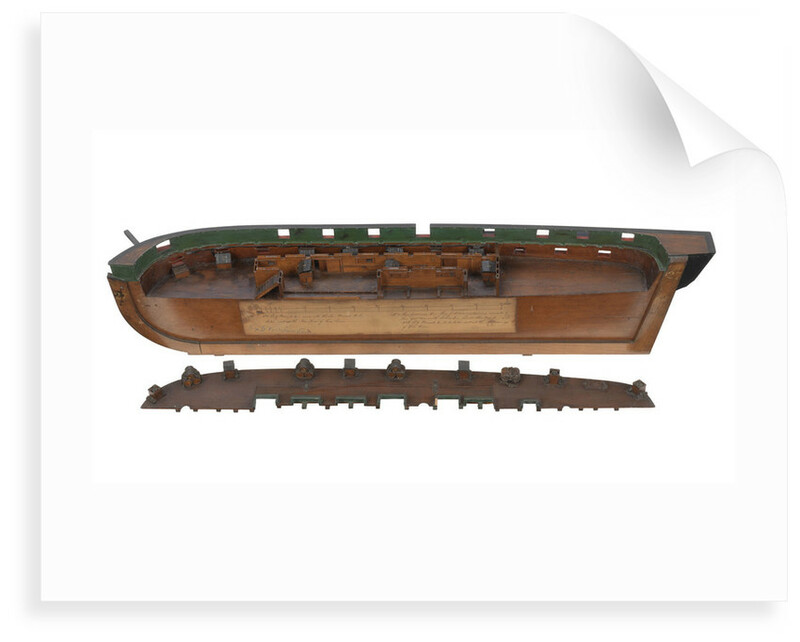 Instructional sectional model of a fireship (1809). Model is decked and equipped. One of two longitudinal half models which together form a complete hull. 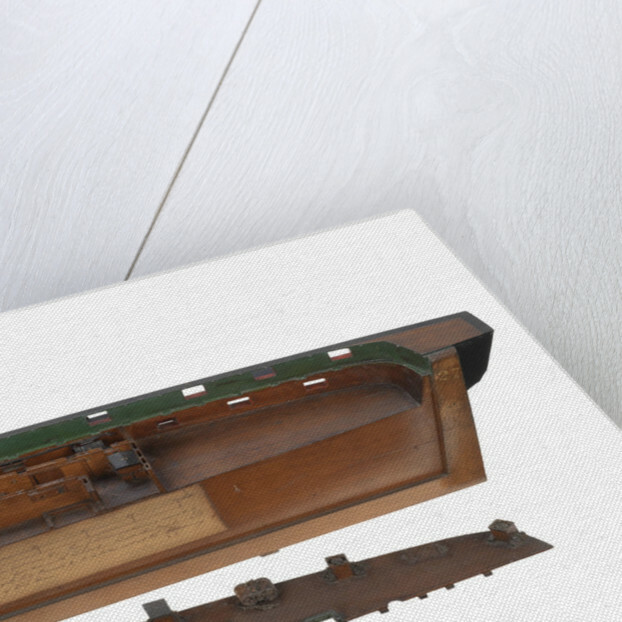 Depicts starboard side; for port side see SLR2820. Shares same plaque and removable deck section with SLR2820. Plaque inscribed "Model shewing the mode of placing the powder boxes, tar barrels & c., in a fire-ship. Proposed by Sir William Congreve - 1809". Various parts annotated on model. Scale: 1:48. A contemporary longitudinal half model of the starboard side of a fireship as proposed by Sir William Congreve (1809). One half of a whole model that divides along the centreline, the other half or port-side model is numbered SLR2820. 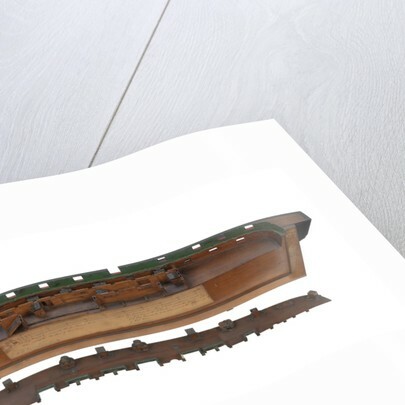 The model illustrates the internal layout of the decks and shows where and how the combustible and explosive material is secured, ready for setting off when the vessel is under sail. A paper label is glued on the inside face of the model and provides a scale as well as a key with descriptive notes for the various numbered parts. 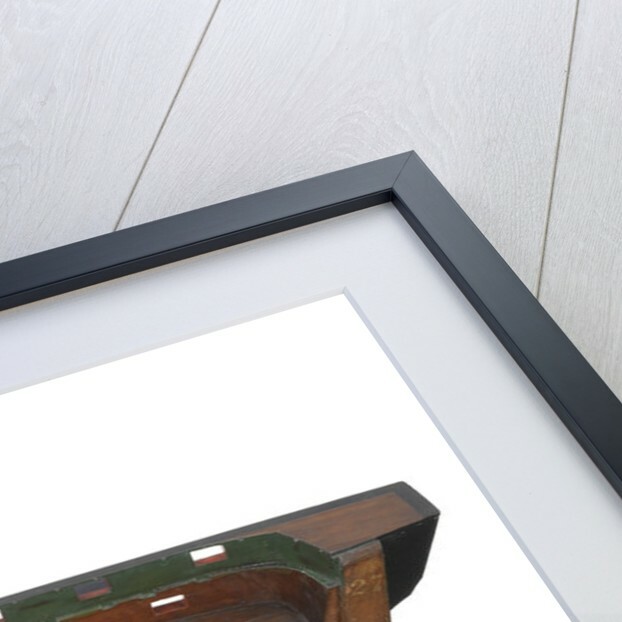 An important feature of these vessels is that the gunport lids are hinged on their lower edge so not to fall closed thus reducing the airflow through the hull. These ships were manned by a skeleton crew who would sail them downwind towards the enemy. At the last possible moment they would take to a boat, which was towed astern, setting the charges as they left.